Hello! As promised, I am back this month with the rest of my Summer 2014 P&P album. Woo Hoo! I am happy to say that I finished it and am now ready to move on to Fall 2014! If you missed the first part of my album, please go HERE to see May & June. My album continues with the month of July. The first photo is one of Sabrina taken during the 4th of July weekend. She loves to sit and "drive" the Ranger! I printed it to be 5x7, slipped it into a 6x8 page protector, stitched the side and trimmed the side and top. I used Journal Tabs - Month to stamp July and die cut with the included coordinating die. On the back side of the 5x7 photo, I made a "layout" and included one of my homemade cards from my stash (originally blogged HERE). I cut a sheet of Cherry Pop cardstock to 5x7 and stitched on the Reach for the Stars Border near the bottom. I added some blue sequins to every other star. The right side of the spread uses a 6x8 page protector with 2 - 3x4 pockets and 1 - 4x6 pocket. The top photo is of Emma and Brina, cousins who are learning to share and be friends. 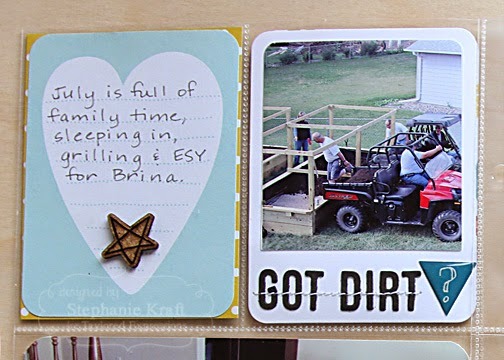 The bottom photo is Brina and Emma getting a ride in the Ranger from Uncle Ron (to Brina)/Papa (to Emma). It was die cut and matted using the Pockets & Pages Essentials - 4x6 dies. 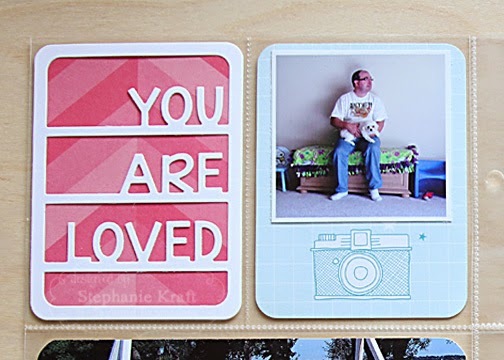 The left side of the next spread uses Pockets & Pages 3x4 You are Loved. The top photo is of Dan bonding with Bella. :) The bottom photo of Brina at the lake includes a sentiment from Coconut Cove. The right side of the spread includes some pre-printed cards from Simple Stories. I added the sun using Little Bits - Sun & Clouds. The top photo is of Brina and 2 friends who hung out one summer day. 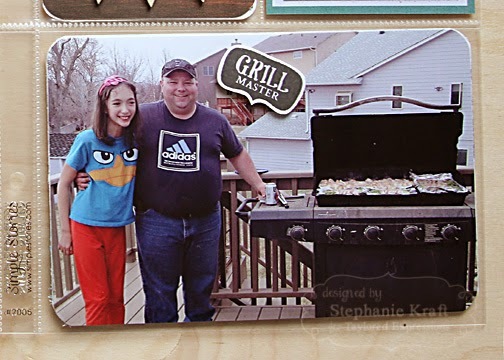 Love this photo with Brina and (cousin) Curt (aka the Grill Master). Sentiment is from Moka Bobby. On the left side of the next spread, I included some short journaling as well as a couple of photos. The "Got Dirt?" 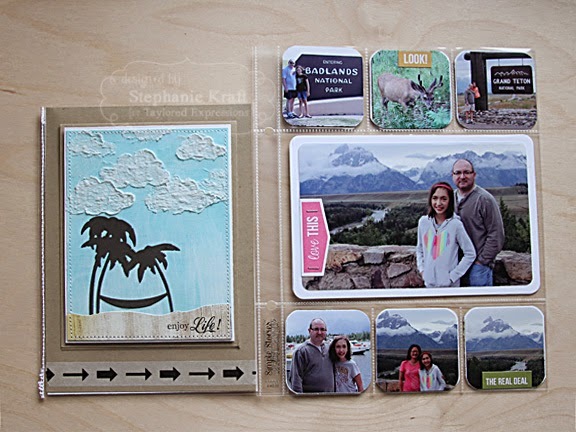 card uses Pockets & Pages 3x4 Photo Frame and the words were created with Mini Caps Alpha & #'s. Photo is of my raised beds being filled with dirt (it finally stopped raining enough for the black dirt to dry out enough for us to order it). We had a big crew of family & friends to help load the dirt, so it all went pretty quickly! 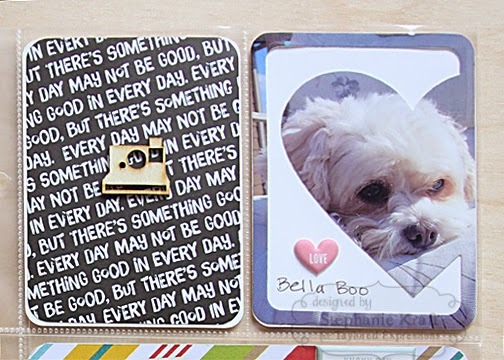 The right side of the spread uses Pockets & Pages 3x4 Part of My Heart to frame a photo of Bella. The lower card includes 2 photos of Brina when she was sick with pneumonia (not a fun couple of weeks for her). 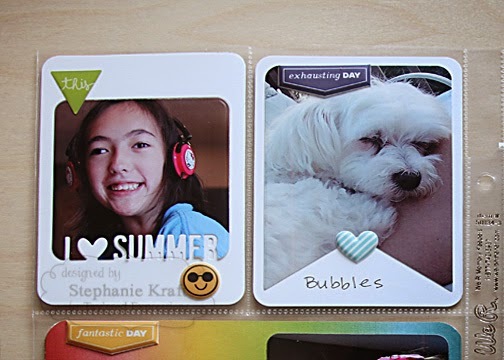 The final full spread for July includes a photo of Brina feeling better, Bubbles (who came to visit for a few days) sleeping on my lap, and one of (cousin) Alex & Brina. 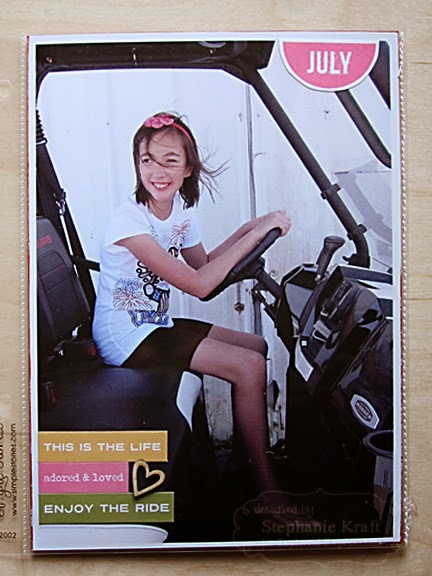 I used Pockets & Pages Fab Frames - Summer and Pockets & Pages 3x4 Banner with Bonus. 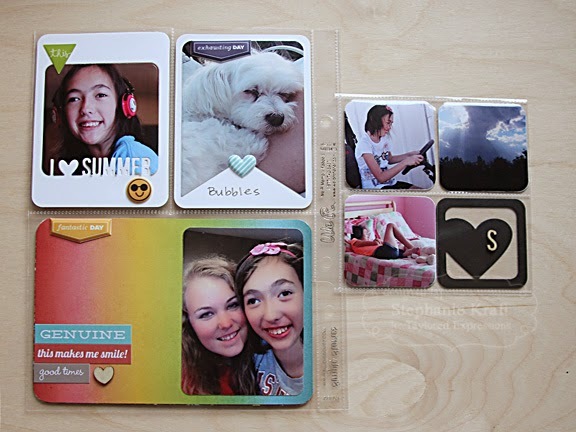 On the right side is a 4x4 We R Memory Keepers page protector with slots for 4 - 2x2 photos. 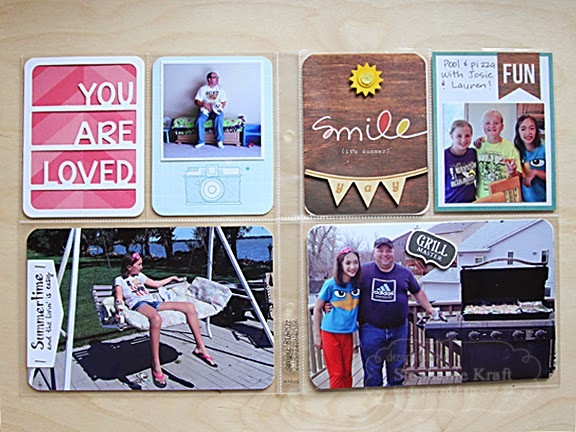 My photos were die cut with Pockets & Pages - 2x2 Essentials and the heart is from Pockets & Pages - Instasquares. Photos are Brina driving the Ranger, summer storm and Brina taking a rare nap). 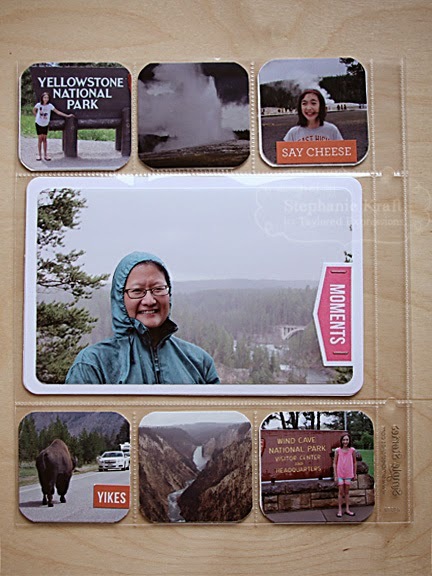 The back side of the 4x4 page protector includes 3 more photos die cut with Pockets & Pages - 2x2 Essentials (Brina swinging, my (late) garden growing! and Bella & Bubbles hanging out). 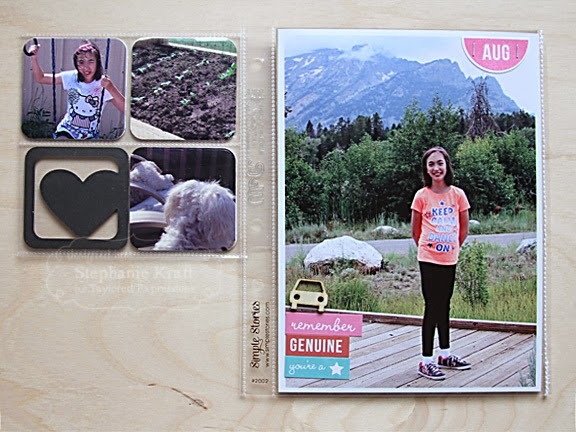 The right side is a 5x7 photo of Brina from our trip to Grand Teton National Park. Once again, I printed it to be 5x7, slipped it into a 6x8 page protector, stitched the side and trimmed the side and top. I used Journal Tabs - Month to stamp August and die cut with the included coordinating die. 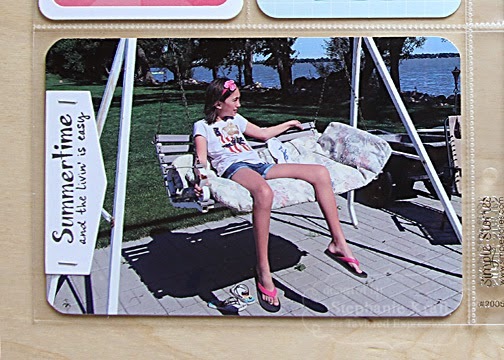 On the back side of the 5x7 photo, I added one of my summer cards from my stash (originally blogged HERE). 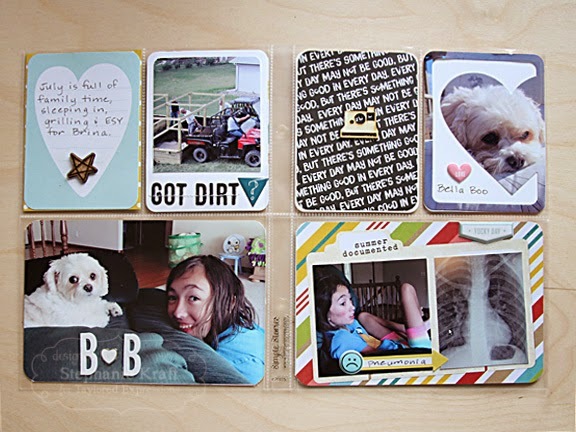 The right side is a page protector with 6 - 2x2 openings and a 4x6 opening. 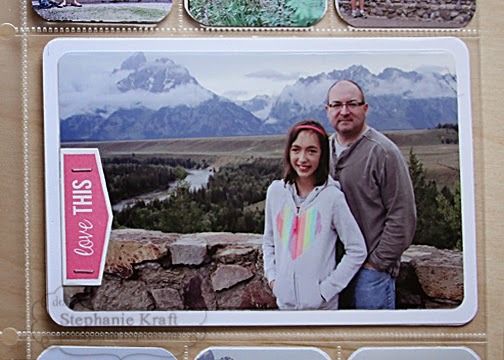 The photos are all from our family summer vacation trip to Wyoming/Idaho. Highlights included a stop @ Badlands NP (on the way), Wind Caves NP (on the way home) and a week visiting Yellowstone NP & Grand Teton NP. Detail shot: "Love this" is from Journal Tabs - Day (stamp + coordinating die). The last page includes more photos from our trip. 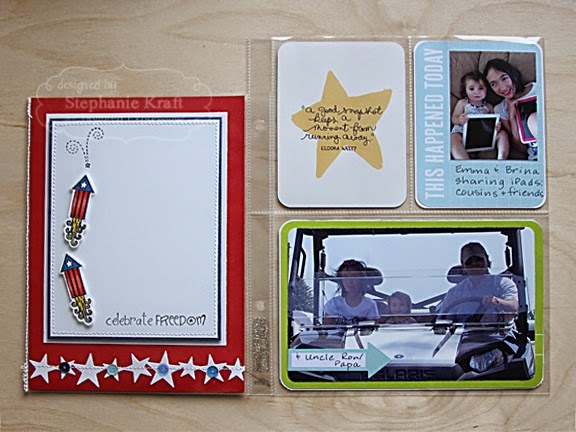 "Moments" is also from Journal Tabs - Day (stamp + coordinating die). I hope you all are having a wonderful week and to those of you in the US, have a Happy Thanksgiving! Thanks so much for stopping by!